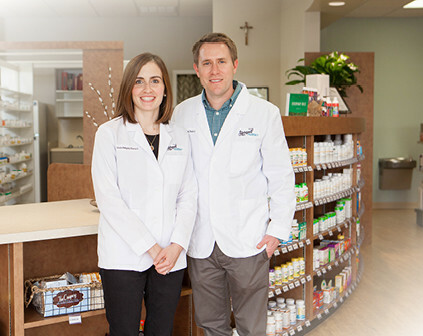 Chad Hobgood, PharmD and Laura Doucet Hobgood, PharmD, owners and Pharmacists at Hobgood Pharmacy, both attended the University of Louisiana at Monroe School of Pharmacy. Chad graduated with a Doctor of Pharmacy degree (PharmD) in 2005 and Laura, in 2007. Chad has experience in the retail setting of pharmacy and has worked for two different retail pharmacy chains in Lake Charles as a staff pharmacist and as a pharmacy manager. Laura has experience as a part-time staff pharmacist in a local hospital and compounding retail pharmacy. The opportunity arose for Chad and Laura to branch out into their own practice. They decided to practice pharmacy in accord with their own personal style and beliefs, ultimately having the ability to live according to their faith in their profession. They wanted to provide special services to fill a niche in the community. Chad and Laura also felt that flexibility in management was imperative to providing the best care possible to their customers. Allowing pharmacists time to consult with patients and exercise professional judgement is vital to pharmaceutical care.